An Ashrama in Hinduism is one of four age-based life stages discussed in ancient and medieval era Indian texts. The four ashramas are: Brahmacharya (student), Grihastha (householder), Vanaprastha (retired) and Sannyasa (renunciation). The Ashramas system is one facet of the Dharma concept in Hinduism. It is also a component of the ethical theories in Indian philosophy, where it is combined with four proper goals of human life (Purusartha), for fulfillment, happiness and spiritual liberation. Brahmacharya (ब्रह्मचर्य) literally means “going after Brahman (Supreme Reality, Self, God)”. In Indian religions, it is also a concept with various context-driven meanings. In one context, Brahmacharya is the first of four Ashrama (age-based stages) of a human life, with Grihastha (householder), Vanaprastha (forest dweller) and Sannyasa (renunciation) being the other three Asramas. Brahmacharya (bachelor student) stage of one’s life, up to about 20 years of age, was focused on education and included the practice of celibacy. In Indian traditions, it connotes chastity during student stage of life for the purposes of learning from a guru (teacher), and during later stages of life for the purposes of attaining spiritual liberation (moksha). Brahamacharya ashrama occupied the first 20–25 years of life roughly corresponding to adolescence.Upon the child’s Upanayanam, the young person would begin a life of study in the Gurukula (the household of the Guru) dedicated to learning all aspects of dharma that is the “principles of righteous living”. Dharma comprised personal responsibilities towards himself, family, society, humanity and God which included the environment, earth and nature. This educational period started when the child was five to eight years old and lasted until the age of 14 to 20 years. During this stage of life, the traditional vedic sciences and various sastras were studied along with the religious texts contained within the Vedas and Upanishads. This stage of life was characterized by the practice of celibacy. The graduation from Brahmacharya stage of life was marked by the Samavartanam ceremony. Grihastha (गृहस्थ) literally means “being in and occupied with home, family” or “householder”.It refers to the second phase of an individual’s life. It follows Brahmacharya (bachelor student) life stage, and embodies a married life, with the duties of maintaining a home, raising a family, educating one’s children, and leading a family-centred and a dharmic social life. Ancient and medieval era texts of Hinduism consider Grihastha stage as the most important of all stages in sociological context, as human beings in this stage not only pursue a virtuous life, they produce food and wealth that sustains people in other stages of life, as well as the offsprings that continues mankind. The householder stage is also considered in Indian philosophy as one where the most intense physical, sexual, emotional, occupational, social and material attachments exist in a human being’s life. Vanaprastha (Sanskrit: वनप्रस्थ) literally means “retiring into a forest”.It is also a concept in Hindu traditions, representing the third of four ashrama (stages) of human life.Vanaprastha is part of the Vedic ashram system, which starts when a person hands over household responsibilities to the next generation, takes an advisory role, and gradually withdraws from the world. Vanaprastha stage is considered as a transition phase from a householder’s life with greater emphasis on Artha and Kama (wealth, security, pleasure and sexual pursuits) to one with greater emphasis on Moksha (spiritual liberation). Vanaprastha represented the third stage and typically marked with birth of grand children, gradual transition of householder responsibilities to the next generation, increasingly hermit-like lifestyle, and greater emphasis on community services and spiritual pursuit. Vanaprastha, according to Vedic ashram system, lasted between the ages of 50 and 74. It encouraged gradual transition of social responsibility, economic roles, personal focus towards spirituality, from being center of the action to a more advisory peripheral role, without actually requiring someone to actually moving into a forest with or without one’s partner. While some literally gave up their property and possessions to move into distant lands, most stayed with their families and communities but assumed a transitioning role and gracefully accept an evolving role with age. Dhavamony identifies Vanaprastha stage as one of “detachment and increasing seclusion” but usually serving as a counselor, peace-maker, judge, teacher to young and advisor to the middle aged. 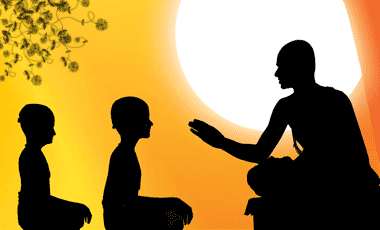 Sanyasa (संन्यास) is the life stage of renunciation within the Hindu philosophy of four age-based life stages. Sannyasa is a form of asceticism, is marked by renunciation of material desires and prejudices, represented by a state of disinterest and detachment from material life, and has the purpose of spending one’s life in peaceful, love-inspired, simple spiritual life. An individual in Sanyasa is known as a Sannyasi (male) or Sannyasini (female) in Hinduism. Hinduism has no formal demands nor requirements on the lifestyle or spiritual discipline, method or deity a Sanyasin or Sanyasini must pursue – it is left to the choice and preferences of the individual.This freedom has led to diversity and significant differences in the lifestyle and goals of those who adopt Sannyasa. There are, however, some common themes. A person in Sannyasa lives a simple life, typically detached, itinerant, drifting from place to place, with no material possessions or emotional attachments. They may have a walking stick, a book, a container or vessel for food and drink, often wearing yellow, saffron, orange, ochre or soil colored clothes. They may have long hairs and appear disheveled, and are usually vegetarians.Some minor Upanishads as well as monastic orders consider women, child, students, fallen men (criminal record) and others as not qualified for Sannyasa; while other texts place no restrictions.